Nuclear power currently accounts for about 20% of electricity generation in the United States, playing an important role in electricity markets. EIA’s 2017 Annual Energy Outlook (AEO2017) Reference case assumes that about 25% of the nuclear capacity now operating that does not have announced retirement plans will be removed from service by 2050. Nearly all nuclear plants now in use began operation between 1970 and 1990. These plants would require a subsequent license renewal before 2050 to operate beyond the 60-year period covered by their original 40-year operating license and the 20-year license extension that nearly 90% of plants currently operating have either already received or have applied for. The AEO2017 Reference case projections do not envision a large amount of new nuclear capacity additions. By 2050, only four reactors currently under construction and some uprates at existing plants are projected to come online. Except during maintenance or refueling cycles, nuclear plants operate around the clock as baseload generators, meaning nuclear plants make up a disproportionately large share of generation compared with their share of electricity generating capacity. Generating capacity using other fuels is typically dispatched at much lower rates than nuclear units. As more nuclear capacity is retired than built, and as other fuels such as natural gas and renewables gain market share, the nuclear share of the U.S. electricity generation mix declines from 20% in 2016 to 11% in 2050 in EIA’s Reference case projections. 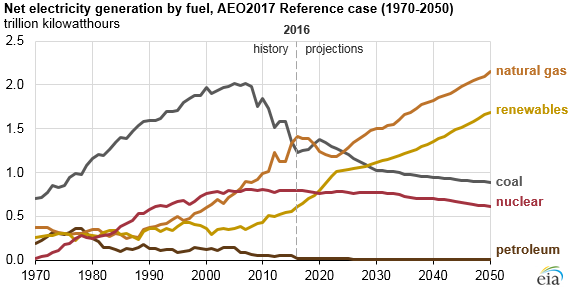 From 2018 through 2050, 9.1 gigawatts (GW) of nuclear capacity is added in the AEO2017 Reference case, which assumes that current laws and policies do not change. Two projects under construction—V.C. Summer in South Carolina and Vogtle in Georgia—each have two reactors and are expected to add 4.4 GW of new nuclear capacity, although their progress has been uncertain since the company manufacturing their reactors, Westinghouse Electric, recently filed for bankruptcy. Another 4.7 GW of added nuclear capacity results from uprates, or operational changes that allow existing plants to produce more electricity. Increases from uprates are expected to end by 2040, as EIA expects that all plants planning to uprate will have completed the projects by 2040. 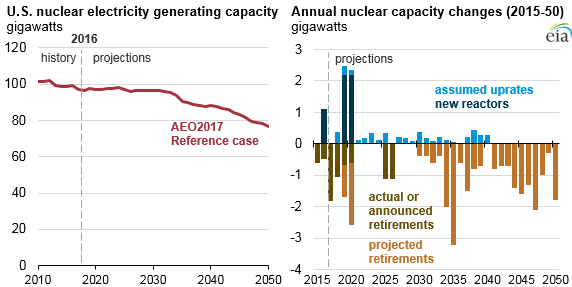 More than offsetting the total addition of 9.1 GW of nuclear capacity from new plants and uprates in the AEO2017 Reference case are projected retirements of 29.9 GW of nuclear capacity from 2018 through 2050. Many of EIA’s anticipated near-term retirements include those that have been announced by plant operators. 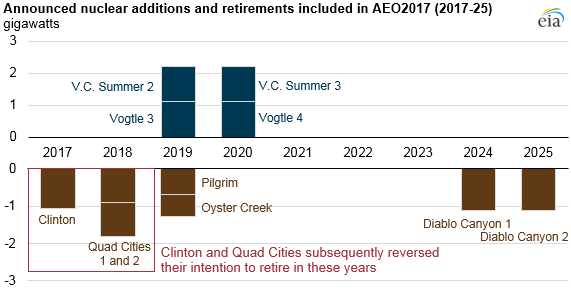 When the AEO2017 assumptions were finalized in late 2016, nuclear plant operators had announced intentions to retire five facilities between 2017 and 2026: Quad Cities Units 1 and 2 in 2017, Clinton Unit 1 in 2018, Pilgrim Unit 1 in 2019, Oyster Creek Unit 1 in 2020, and Diablo Canyon Units 1 and 2 in 2025 and 2026. Since AEO2017 assumptions were finalized, legislation passed by the Illinois government created financial incentives through 2026 to support the continued operation of Quad Cities and Clinton. Operators of these two plants subsequently withdrew their announcements to retire those plants, reducing the amount of capacity likely to retire in 2017 and 2018. However, in the months since AEO2017 assumptions were finalized, Entergy also announced its intention to retire three plants: Michigan’s Palisades in 2018 and New York’s Indian Point Units 2 and 3 around 2020. New commercial nuclear power plants are licensed by the Nuclear Regulatory Commission (NRC) for 40 years. Because many nuclear plants were built more than 40 years ago, nearly 90% of currently operating nuclear plants are currently operating under or have applied for 20-year license renewals. Plant operators may apply for subsequent license renewals to continue operating for an additional 20 years (a total of 80 years). The capital investment needed to extend the life of nuclear plants beyond 60 years is currently unknown and could vary significantly across the nuclear power fleet. Other areas of uncertainty include plant operators’ interest in obtaining subsequent license renewals and the Nuclear Regulatory Commission’s willingness to grant those license renewals for plants to operate beyond 60 years. Furthermore, policy or technology cost developments that might advantage or disadvantage existing nuclear plants relative to other generation technologies and the cost of natural gas are likely to play an important role in future retirement decisions.